Address : 33-35 Jalan Hang Lekiu, 50100 Kuala Lumpur. From our humble inception in 1977, offering certificate programmes, SEGi’s Kuala Lumpur campus has grown from strength to strength and now offers a wide range of programmes from foundation to master degree levels. 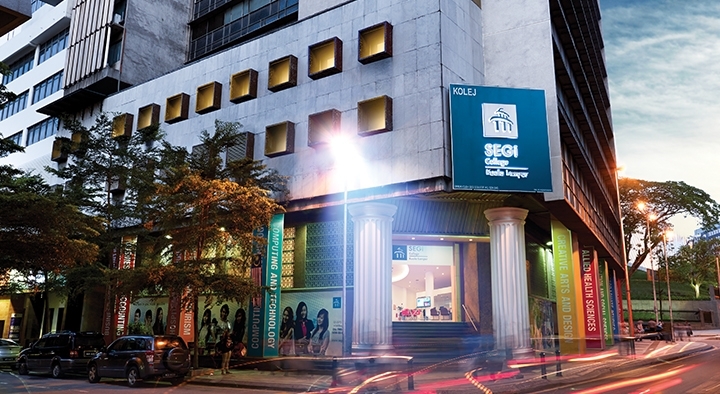 SEGi College Kuala Lumpur’s track record is renowned throughout the Klang Valley and parents who have studied at SEGi continue to recommend their children to study at this campus. The campus is strategically located in the capital city of Malaysia, where students enjoy the perks of cosmopolitan living - easy access to all modern amenities of the city such as the Light Rail Transport (LRT), buses, shopping malls, banks, restaurants, tourist attractions, and entertainment spots. With more than 35 years of education excellence, SEGi College Kuala Lumpur has nurtured and groomed thousands of graduates who have gone on to become leaders in their chosen fields. The college also boasts having many lecturers with more than 10 years’ experience. To date, the college has more than 6,000 students studying full-time and part time modes.